With easy ingredients and a blender, you can make this at home in just 5 minutes. Kids and adults alike will love this smoothie recipe! First, add your milk of choice to the bottom of a high speed blender. 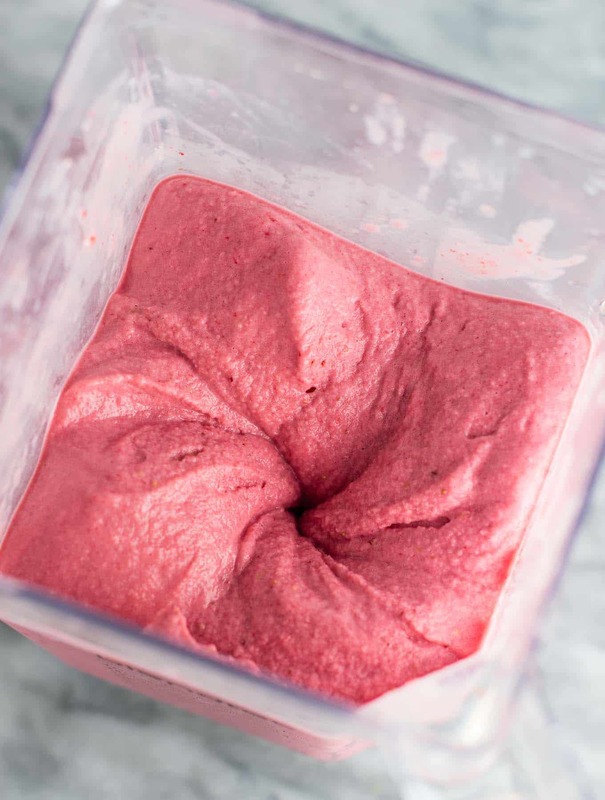 You will need a high powered blender to make this recipe, as it is very thick and a normal blender would most likely not be able to handle it. Adding the milk first to the blender will help it blend easier. I recommend either a Blendtec or a Vitamix. 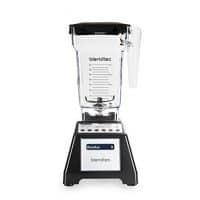 I personally have a Blendtec and have been happy with it. Basically you just need a higher powered blender if you want that super thick ice cream texture. 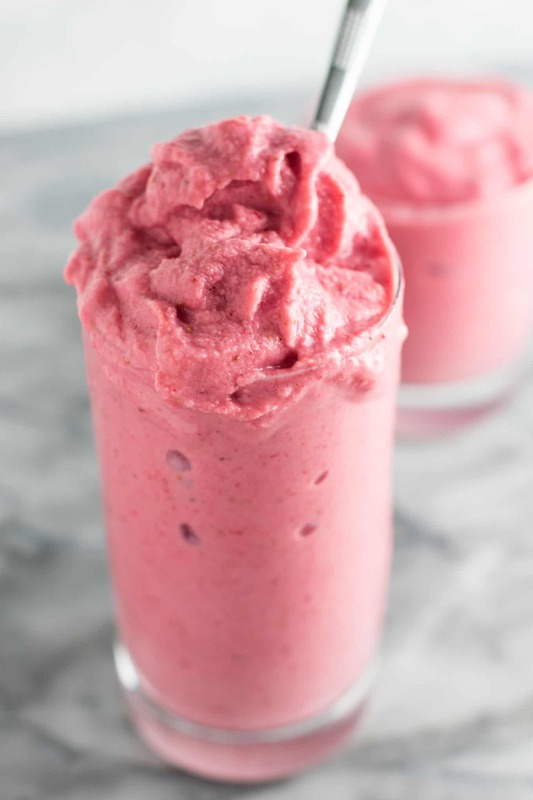 Add your frozen strawberries and bananas over the milk, and blend it all up! This smoothie is super thick, so you might need to stop blending and use a spoon to mix it all around. Be patient, it will blend! 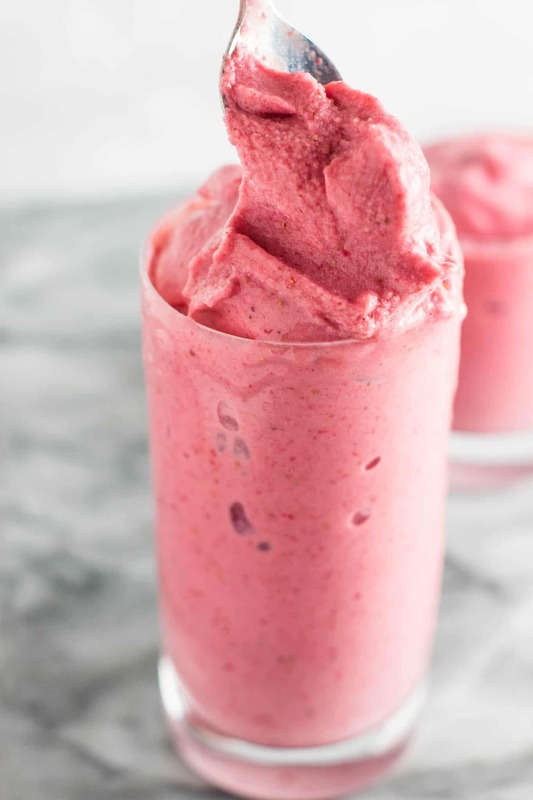 After a few minutes, you’ll have a super thick and creamy smoothie that tastes like ice cream! I gladly take a few extra minutes to help the smoothie blend instead of adding more milk. As far as smoothies go, the thicker the better in my opinion! I’m all about that ice cream texture smoothie. There is nothing better! Add your milk to the blender first. This will help make sure the blender works the best that it can, and has easy access to the liquid of the recipe. 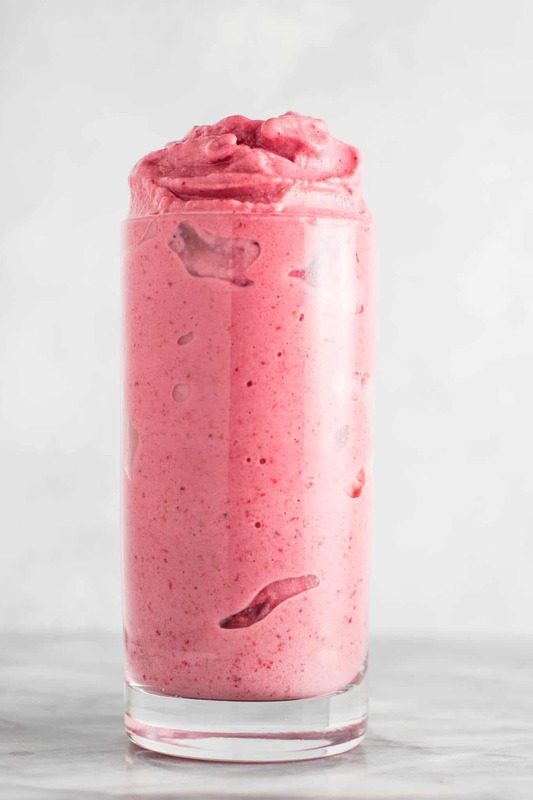 If you do not have a high speed blender, you may need to add more milk to make it not as thick so that the blender can handle mixing the smoothie up. If you don’t care about thickness, you can make this more easily by splashing in some extra milk to help the blender out. It’s really whatever works for you! Isn’t the color just gorgeous? Fruits are nature’s rainbow and I love it! 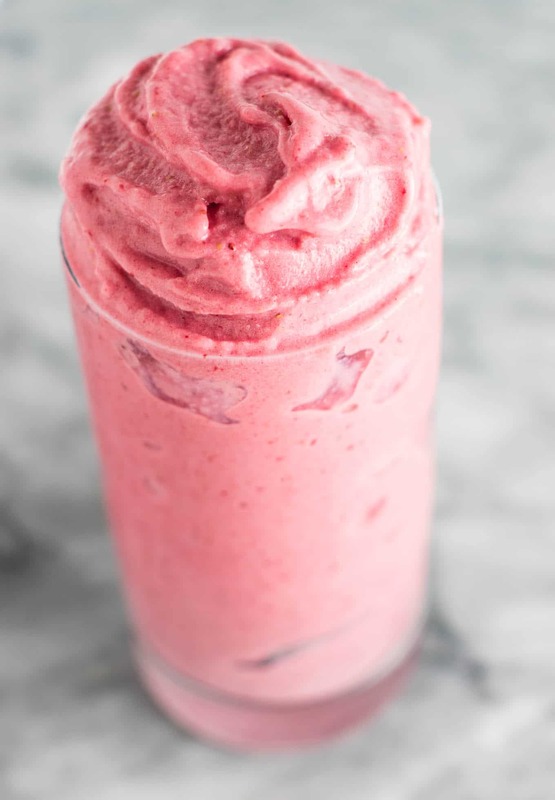 This smoothie is such a gorgeous pink color and it makes me happy. I eat mine with a spoon like ice cream and it is so satisfying. Cool and creamy, and totally guilt free. You totally feel like you are indulging, but it’s so healthy for you! Don’t you just love easy healthy recipes that don’t taste healthy? If you have a sweet tooth in the morning, try this for breakfast! If for some reason you want your smoothie to be less thick (say, to drink it out of a straw) just add more milk until it’s the consistency that you want. Another question I have been asked is what type of milk I suggest. Any milk you have will work. You won’t really notice a flavor difference, or much of one. I used 2% milk as it is what I had on hand, but you can use whole milk, almond milk, soy milk, whatever basic milk you have on hand. Dairy free or dairy – it won’t make much of a difference. No need to run to the store, just use what you have! I hope you love this recipe as much as our family did! Looking for more easy healthy smoothies to make at home? Here are some more of my tried and true recipes! This Sweet Potato Smoothie is full of veggies but tastes like a dessert! Seriously so good, you have to try it. Best Green Smoothie Recipe If you’ve never had a green smoothie that tastes good, you have to try this recipe. It’s so delicious you will crave it! Blueberry Pie Smoothie Tastes like a slice of your favorite blueberry pie in healthy smoothie form! Want to save this recipe on your Pinterest board for later? 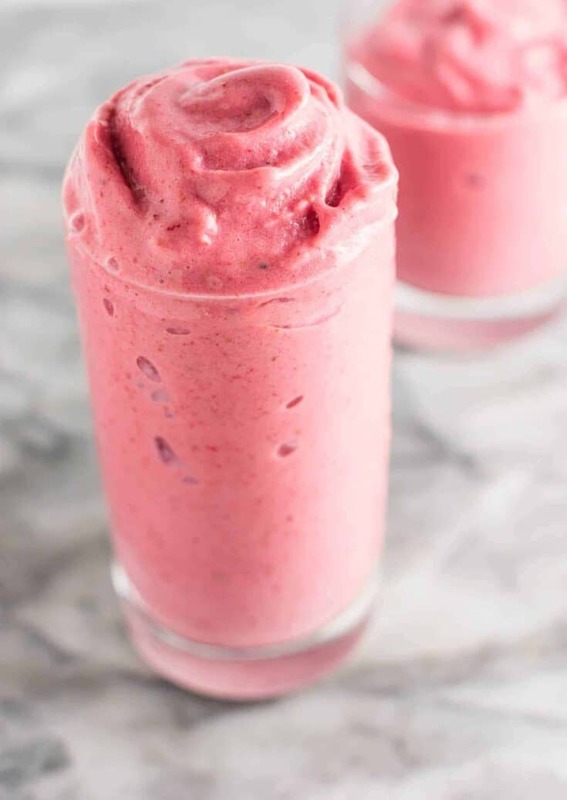 An easy, healthy strawberry banana smoothie recipe with just 3 ingredients. It tastes like ice cream! You will need a high speed blender for this recipe (I love my blendtec). 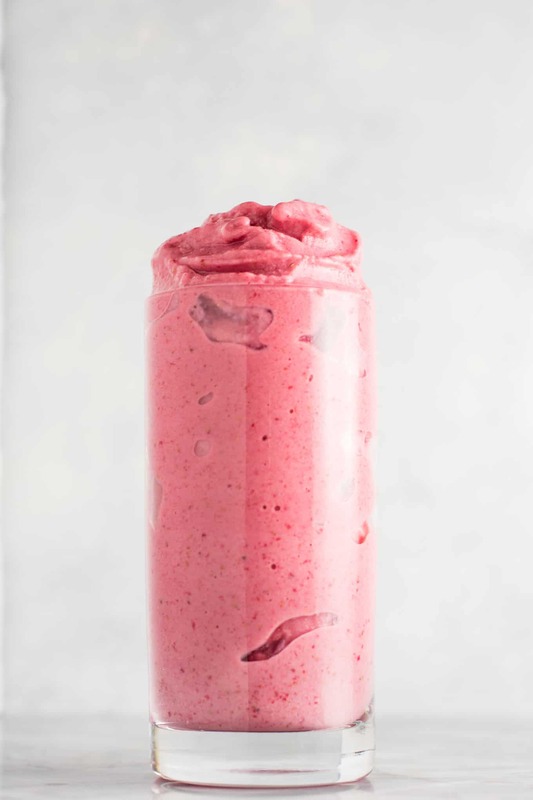 Because this smoothie is so thick, it likely will not blend in a regular blender. If needed, add more milk to help the smoothie blend. Looks delicious and healthy for stomach. Thanks for the recipe! Very delicious , i made my this morning and had it after my workout! This recipe looks great. Can I use Greek yogurt (instead of milk or half milk half Greek yogurt)? Or would that make it too thick? I want to added protein & healthy bacteria. I think it would make it too thick to sub for milk, but you could always add some greek yogurt in, and a little additional milk + the original amount to make it not too thick. It would still taste great! Tastes like ice cream, so good! Do you really only use 1 cup of banana chunks? Seems like that would only be about 4 chunks or less. Yes, that is correct. Probably equates to one small banana or 1/2 of a large one.